​Honeywood stands at the western end of Carshalton Ponds surrounded by historic buildings and water features which together form one of the most interesting and attractive areas in Greater London. The front mostly dates from the nineteenth and early twentieth centuries but behind the façade there is a seventeenth century flint and chalk chequer building. A stream flows beneath the house: a curious feature which hints at an unusual origin. Upper Pond next to the house was probably created for Thomas Howard, Earl of Arundel in the 1630s. It was probably part of some larger project but we do not know what was intended or whether the site of Honeywood was included in it although there is archaeological evidence of activity on the site around this time. Honeywood was built sometime after this – perhaps around 1680. Another building was erected about the same time which stood between the present Honeywood and Pound Street until 1884 when it was demolished. This missing building was confusingly called Honeywood while the present Honeywood was called Wandle Cottage until the name was transferred after 1884. We call the buildings Honeywood 1 and Wandle Cottage until 1884 when the latter became Honeywood. The original back walls of the two buildings were aligned and it is possible they were originally a single long rather narrow structure. It was an odd shape for a house and an even stranger location as it was erected across the outflow from a line of springs: a very damp and inconvenient place. The obvious explanation is that the building was connected with the use of the water. A mill is a possibility but there is not enough power on the site to make it viable. Another more likely explanation is a cold bath. The masochistic practice of bathing in cold water was a popular cure-all in the seventeenth and early eighteenth centuries and numerous small establishments were created to meet the demand. 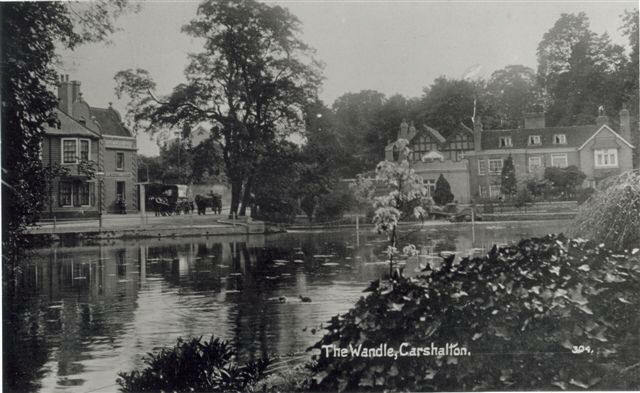 At that time Carshalton was famous for the purity of its waters and it was also something of a sporting centre and out of town resort favoured by well-heeled Londoners. It is a likely location for a small commercial cold bath but no documentary evidence has been found so far. We do not know who erected the original buildings and there is no certain evidence for the occupiers until 1749 when George Otway appears in the Carshalton rate books. Otway was a Southwark cheesemonger who had presumably made enough money to acquire an out of town house. He was described as ‘of Carshalton’ in 1767 but he later moved to Great Bookham where he died in January 1777. George left Wandle Cottage and Honeywood to Sarah Phillips of Newington Green, in what is now north London. She had been born Sarah Andrews, at Oxted, in 1720. In 1749 she married a Southwark wine merchant called John Phillips who was a distant relative of George Otway. John died in 1754 and Sarah remained a widow for the rest of her life. She never lived in Honeywood but rented the houses out, as George Otway had done in his later years. Her tenant was a London timber merchant called Morphew Yarroway who lived in Honeywood and sub-let Wandle Cottage to John Bourke, a London merchant specialising in the Africa and West India trades which centred on slaves and sugar. He probably used Wandle Cottage as a country retreat and a healthy place for his children. Bourke and his wife Mary retired to Carshalton where he died in 1806, and she in 1816. The next tenant, William Graham, was another Londoner. He agreed to spend at least £150 building an extension on the back which contained a new sitting room with a bedroom above. Graham was followed by a succession of tenants in the early and mid-19th century. One of these improved Wandle Cottage by extending the front and adding the bay window which is now part of the shop. The most noteworthy of the Victoria tenants was William Hale White, a civil servant who later became a significant writer, known particularly for his ‘autobiography’ of Mark Rutherford which was a fictionalised account of his own life. He became a friend of John Ruskin and also of the pre-Raphaelite artist Arthur Hughes who lived in Wallington. White and his wife found the house too damp and left after a year. In September 1878 by John Pattinson Kirk and his wife Leah became tenants of Wandle cottage. The Kirks would transform Wandle Cottage into the Honeywood that we know today. Kirk was born in Alston in Cumberland in 1835. In 1874 he was described as ‘a commercial traveller of Alston’ – a travelling salesman. The next few years saw an astonishing transformation in his life. In 1878 he moved into Wandle Cottage with his wife Leah who was eighteen years younger. In 1883 he bought the freehold of both Wandle Cottage and Honeywood 1. At that time he was working for Marion and Co. who were then the largest photographic retailers in Europe.At some point in the 1880s or 1890s Kirk became the managing partner. This gave him the money to improve the house. He demolished Honeywood I about 1884 andtransferred the name to Wandle Cottage which has been called Honeywood ever since. New building came slowly. About 1898 Kirk demolished the wooden weatherboarded north wing and replaced it with the present brick structure. The 1901 census shows the reason for the change. The household then consisted of John P Kirk, widower and retired merchant; Lily Edwards his adopted daughter, Henry Edwards her husband, their six month old son Leslie and three live in servants. Leah had died in 1892. Lilly and Henry had another son Kenneth in 1902. ​In 1902/3 Kirk made a further and much larger and more ambitious addition to the south end of the house. It contained a billiards room, drawing room, photographic dark room, wine store and toilet on the ground floor with two bedrooms and a large nursery above, the latter clearly for Lily’s children. The billiards room was splendidly fitted out with built-in raised seating, a table and scoreboard and a Jacobean style fireplace with ventilators to disperse the cigar and cigarette smoke. The drawing room, which opened to the garden through French doors, was equally fine with an elaborate fireplace, mouldings on the walls and a seat in a window niche above the stream from the garden. The extension transformed Honeywood into a well-appointed upper middle-class house with space for child rearing and pretentious socialising. John Pattinson Kirk died in 1913 and his adopted daughter Lily became the principal figure in the house as it had been left to her rather than her husband Henry Edwards. Lily was an artist who exhibited at the Institute of Painters in Watercolours and the Society of Women Artists. Henry Edwards died of heart disease in October 1928. In the 1920s and 1930s Carshalton and the surrounding area were becoming suburbanised. The Council was anxious to preserve the area around the Ponds and in April 1939 they offered £2000 for Honeywood. The sale was completed at the beginning of the Second World War. The house was allocated to the air raid precautions service to be used as a training and recreation centre for the wardens and as a store for their equipment. ​After the war Honeywood was let for social functions. Part was used for offices and some of the upper floor became a caretaker’s flat. 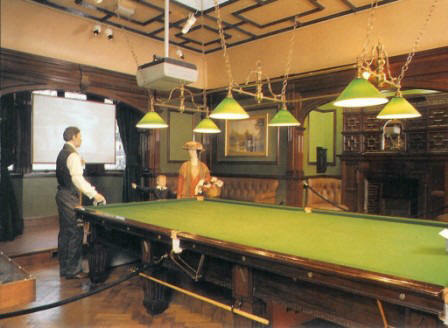 NALGO (the trade union) was allowed to use the billiards room as a social facility. In the mid-1980s the building was let to a charity. A repairs backlog slowly built up and at the end of the 1980s the building was in a poor state and infested with dry rot. At this time the Council wanted to create a heritage centre for the borough. Several buildings were considered but Honeywood was chosen because of its attractive pond side location and its obvious historic interest. The first stage of the Heritage Centre opened on the ground floor on 1 December 1990. The exhibitions on the upper floor were gradually completed over the next few years. 2007 saw Honeywood achieve Museum Status. In 2010 the Heritage Lottery Fund, Sutton Council and Sutton Arts Council joined together to finance a major refurbishment which was completed in 2012.